Hello, my name is Luciana! Music has been one of my passions since the fourth grade. I mainly play violin, but I'm currently learning piano. I really like all types of music from classical to rock and enjoy leaning different ways to play them on my violin. Growing up around music students and taking part in concerts has influenced my wanting to work with younger students, which to this day is what I love doing. 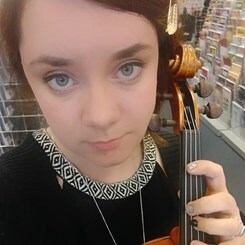 I am currently attending college to become a highschool art teacher so I can take what I've learned from helping in orchestras working with classmates and students and help others.